Debugging view showing underlying avatar textures and baked textures. Definition at line 122 of file llfloateravatartextures.cpp. References LLViewerObjectList::findObject(), LLXform::getParent(), gObjectList, LLViewerObject::isAttachment(), LLPrimitive::isAvatar(), and NULL. Referenced by LLFloaterAvatarTextures::onClickDump(), and LLFloaterAvatarTextures::refresh(). 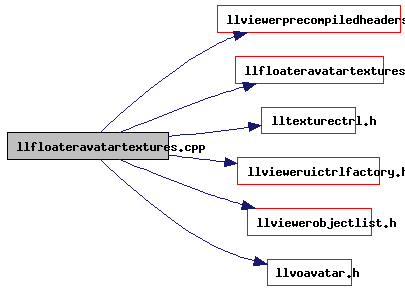 Definition at line 105 of file llfloateravatartextures.cpp. References LLTextureEntry::getID(), LLPrimitive::getTE(), IMG_DEFAULT_AVATAR, LLUUID::null, LLTextureCtrl::setImageAssetID(), and LLView::setToolTip().